A NASA team plans to build the first integrated-photonics modem, using an emerging, potentially revolutionary technology that could transform everything from telecommunications, medical imaging, advanced manufacturing to national defense. The cell phone-sized device incorporates optics-based functions, such as lasers, switches, and fiber-optic wires, onto a microchip similar to an integrated circuit found in all electronics hardware. The device will be tested aboard the International Space Station beginning in 2020 as part of NASA’s multi-year Laser Communications Relay Demonstration (LCRD). The Integrated LCRD LEO (Low-Earth Orbit) User Modem and Amplifier (ILLUMA) will serve as a low-Earth-orbit terminal for NASA’s LCRD, demonstrating another capability for high-speed, laser-based communications. Since its inception in 1958, NASA has relied exclusively on radio frequency (RF)-based communications. Today, with missions demanding higher data rates than ever before, the need for LCRD has become more critical, said Don Cornwell, director of NASA’s Advanced Communication and Navigation Division within the space Communications and Navigation Program, which is funding the modem’s development. LCRD, expected to begin operations in 2019, promises to transform the way NASA sends and receives data, video and other information. It will use lasers to encode and transmit data at rates 10 to 100 times faster than today’s communications equipment, requiring significantly less mass and power. Such a leap in technology could deliver video and high-resolution measurements from spacecraft over planets across the solar system — permitting researchers to make detailed studies of conditions on other worlds, much as scientists today track hurricanes and other climate and environmental changes here on Earth. A payload aboard the Lunar Atmosphere and Dust Environment Explorer (LADEE) demonstrated record-breaking download and upload speeds to and from lunar orbit at 622 megabits per second (Mbps) and 20 Mbps, respectively, in 2013 (see “NASA laser communication system sets record with data transmissions to and from Moon“). LCRD, however, is designed to be an operational system after an initial two-year demonstration period. 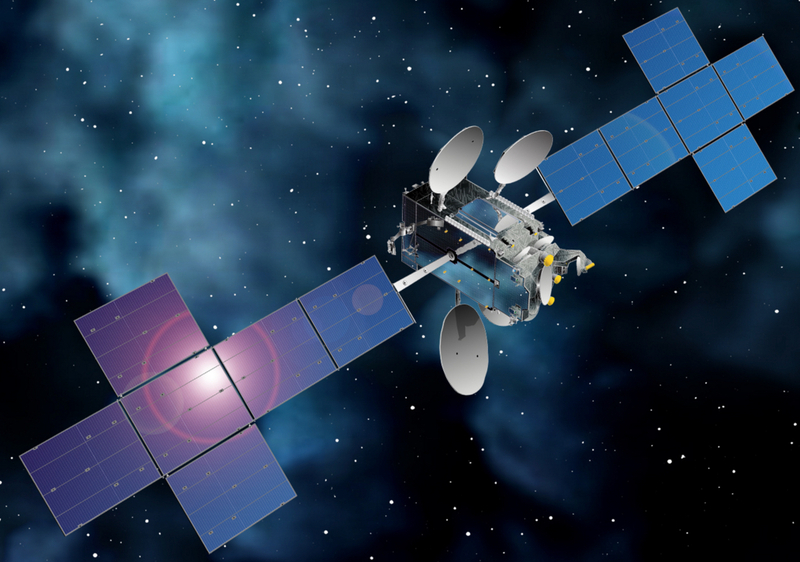 It involves a hosted payload and two specially equipped ground stations. The mission will dedicate the first two years to demonstrating a fully operational system, from geosynchronous orbit to ground stations. NASA then plans to use ILLUMA to test communications between geosynchronous and low-Earth-orbit spacecraft, Cornwell said. ILLUMA incorporates an emerging technology — integrated photonics — that is expected to transform any technology that employs light. This includes everything from Internet communications over fiber optic cable to spectrometers, chemical detectors, and surveillance systems. “Integrated photonics are like an integrated circuit, except they use light rather than electrons to perform a wide variety of optical functions,” Cornwell said. Recent developments in nanostructures, metamaterials, and silicon technologies have expanded the range of applications for these highly integrated optical chips. Furthermore, they could be lithographically printed in mass — just like electronic circuitry today — further driving down the costs of photonic devices. 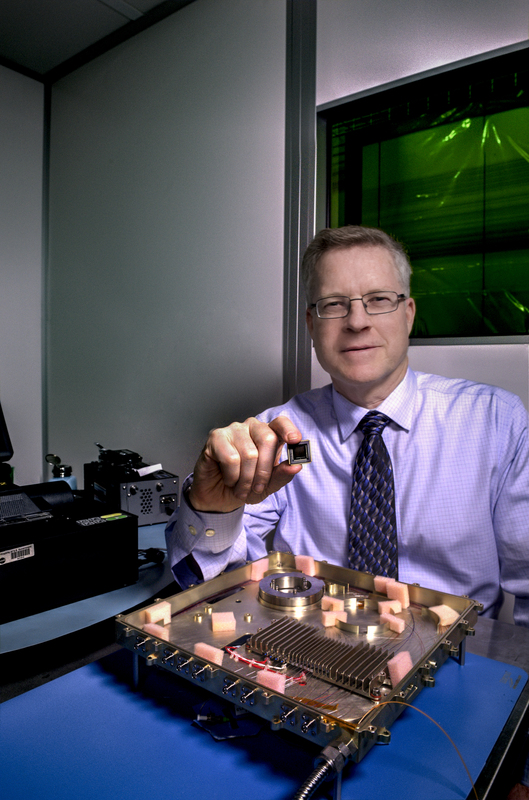 Krainak also serves as NASA’s representative on the country’s first consortium to advance integrated photonics. Funded by the U.S. Department of Defense, the non-profit American Institute for Manufacturing Integrated Photonics, with headquarters in Rochester, New York, brings together the nation’s leading technological talent to establish global leadership in integrated photonics. Its primary goal is developing low-cost, high-volume, manufacturing methods to merge electronic integrated circuits with integrated photonic devices. NASA’s Space Technology Mission Directorate (STMD) also appointed Krainak as the integrated photonics lead for its Space Technology Research Grants Program, which supports early-stage innovations. The program recently announced a number of research awards under this technology area (see related story). Under the NASA project, Krainak and his team will reduce the size of the terminal, now about the size of two toaster ovens — a challenge made easier because all light-related functions will be squeezed onto a microchip. Although the modem is expected to use some optic fiber, ILLUMA is the first step in building and demonstrating an integrated photonics circuit that ultimately will embed these functions onto a chip, he said. ILLUMA will flight-qualify the technology, as well as demonstrate a key capability for future spacecraft. In addition to communicating to ground stations, future satellites will require the ability to communicate with one another, he said. “What we want to do is provide a faster exchange of data to the scientific community. Modems have to be inexpensive. They have to be small. We also have to keep their weight down,” Krainak said. The goal is to develop and demonstrate the technology and then make it available to industry and other government agencies, creating an economy of scale that will further drive down costs. “This is the payoff,” he said. Although integrated photonics promises to revolutionize space-based science and inter-planetary communications, its impact on terrestrial uses also is equally profound, Krainak added. One such use is with data centers. These costly, very large facilities house servers that are connected by fiber optic cable to store, manage and distribute data. Integrated photonics promises to dramatically reduce the need for and size of these behemoths — particularly since the optic hardware needed to operate these facilities will be printed onto a chip, much like electronic circuitry today. In addition to driving down costs, the technology promises faster computing power.